LISTEN NOW! 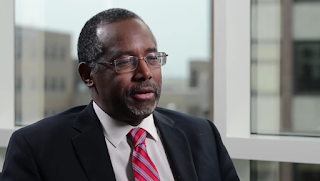 In this first part of Dr. Carson’s interview by Dr. James Robertson, Dr. Carson shares from a time in his youth that he was a very angry and violent young man and always felt that his rights were being infringed upon. He speaks of times where he acted out on this anger even a time he went to hit his mother with a hammer but before striking her in the head his brother grabbed the hammer from behind. One day he reached out to God who then took away all his anger. Some said he was hiding it but his response to it is, “When God fixes it you can’t deny it”. He was asked at one point what kept him from being racist? He responded saying, being a neurosurgeon, once you get beneath the skin and bone we are all the same color. It wasn’t until he found God before he was able to get beyond some beliefs. Part 2 of 3 of Dr. Ben Carson’s interview.